For the Fall of 2017 TCX took to the task of developing a motorcycle boot for women riders that expertly walks the line between all-day wearability and cutting-edge performance. 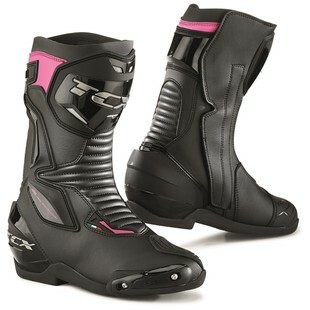 What they came up with was the TCX SP-Master Women’s Boots. Constructed with a soft-touch microfiber upper and incorporating additional impact cushioning at the front and rear, the SP-Master Women’s Boots are built to be worn for the long hauls. At the same time, however, TCX did not miss out on the details of precision performance that can be see in the polyurethane ankle retention system, heel guards, ergonomic shin plates, shift pads, and interchangeable PU toe sliders. Additional features of the TCX SP-Master Womens Boots include a CE-certification, wide VELCRO closure bands, and an Air Tech breathable inner lining that allows air to move better throughout. Specifically designed to better fit the feet of female riders, the SP-Master Women’s Boots are a great option for motorcyclists in search of one boot that can accomplish many different jobs in the saddle.